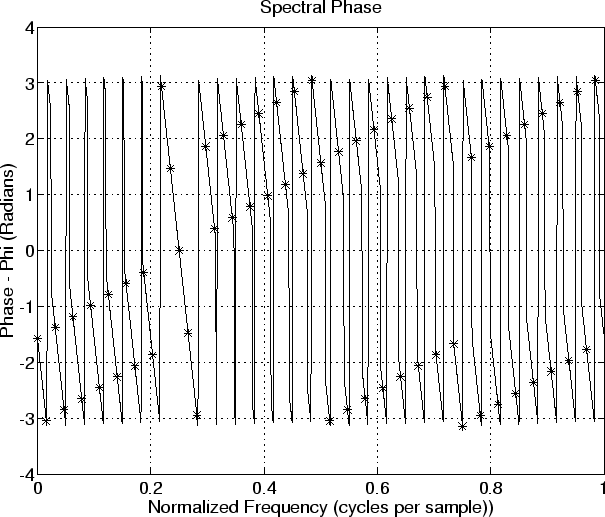 As for the phase of the spectrum, what do we expect? We have chosen thesinusoid phase to be zero. The window is symmetric about its middle. Therefore, we expect a linear phase term with slope -(M-1)/2 samples. Also, the window transform has sidelobes which cause a phase of pi radians to switch in and out. Thus, we expect to see samples of a straight line with slope -15 across the main lobe of the window transform, together with a switching offset by pi in every other sidelobe away from the main lobe, starting with the immediately adjacent sidelobes. In the plot, you can see the negatively sloped line across the main lobe of the window transform, but the sidelobes are hard to follow. To convert the expected phase slope from “radians per radian-frequency” to “radians per cycle-per-sample,” we need to multiply by “radians per cycle,” or . Thus, in Fig. 9.10, we expect a slope of radians per unit normalized frequency, or radians per cycles-per-sample, and this looks about right, judging from the plot.